Elliotts Kevlar Blue welding gloves are certified by SAI Global to the Australian Standards AS/NZS 2161.3:2005 (EN388) Protection against mechanical risks and AS/NZS 2161.4:1999 (EN407) Protection against thermal risks (heat and fire). KEVLAR® BLUE® welding gloves now combine their famous comfort and durability with a certified level of protection for professional welders. The KEVLAR® BLUE® welding glove is designed for extra durability with the addition of an extra piece of leather covering the palm and thumb area. The extra reinforcing knuckle bar strip across the back of the hand protects that knuckles and offers additional abrasion protection. We only use the highest quality leather and cotton liners and all wear seams are welted for additional protection and all seams are sewn with heat resistant Kevlar® thread for extra durability. 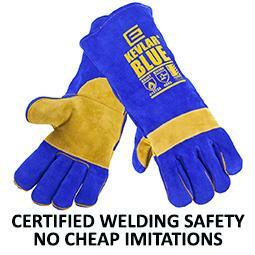 The KEVLAR® BLUE® welding glove is manufactured from soft, premium, selected leather.